Hi. I’m Hannah Danson, and my business is HD Words. 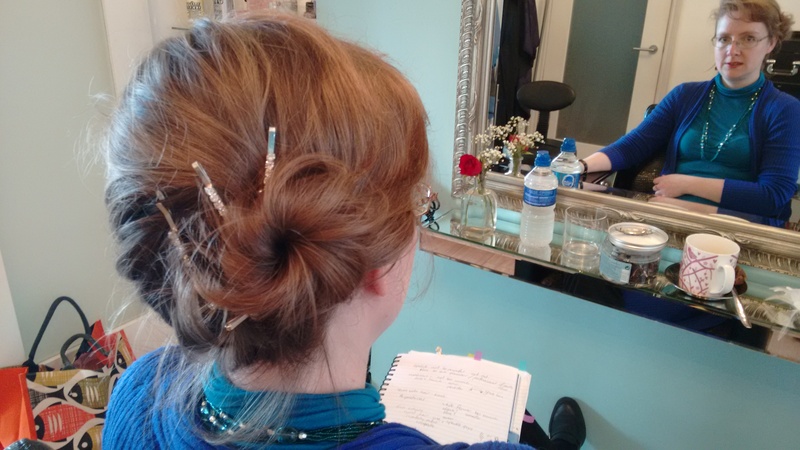 I write web content, including blogs, for clients like Maria Sanchez at Cornwall Beauty Box, and Maria tested out her new Professional Styling Consultation on me, in return for some words. I have to admit, I don’t wear a lot of makeup. 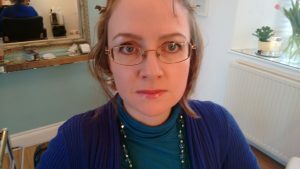 I went into the consultation unsure of what colours suited me, how to make the most of my colouring, and even whether my hairstyle suited me. I also needed some ideas on how to wear my hair up. The Professional Styling Consultation package is designed for women like me, in business, needing to look professional. You could be someone who wears a lot of makeup, but maybe you wonder if it’s a little outdated now, or whether the image you’re projecting is correct for how you want people to read you. If your business is corporate finance, your ‘professional’ might look a little different from someone who is a wedding planner specialising in boho-chic. So how do you get it right? Maria is an expert in makeup and hair, and is very good at deconstructing a person’s face to reveal the highlights, the colours, the shapes. She will be able to help you make the most of your natural beauty, and come up with a makeup ‘look’ that is achievable, and gives the image you’re trying to portray, whatever that is. So, back to my consultation. Maria asked me to arrive dressed and made up as if I was meeting an important new client, as opposed to the bank (so not a suit) and not a client that I’ve known for a while and don’t need to impress. We began by looking at the makeup I was wearing, the initial impression I gave, what ‘popped’ in my face. Apparently, my eye makeup was obvious, rather than highlighting my eyes and making them the focus. 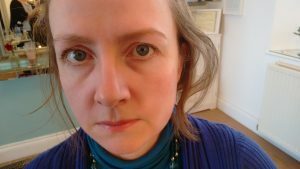 And I wasn’t using the best colour for my eyes either. So I learned something within the first few minutes. We talked about what I wanted to ‘tell people’ by my appearance, how I wanted to come across, and how I could avoid looking too harsh, then cleaned off all my makeup, for a fresh start. Maria applied a light foundation, explaining the steps she took as she went, as well as telling me what not to do. As someone who never wears foundation, this was very instructive, and I couldn’t believe how much better the blotchiness on my skin appeared, with even the lightest of coverings. It didn’t look trowelled on, at all, and was virtually invisible. 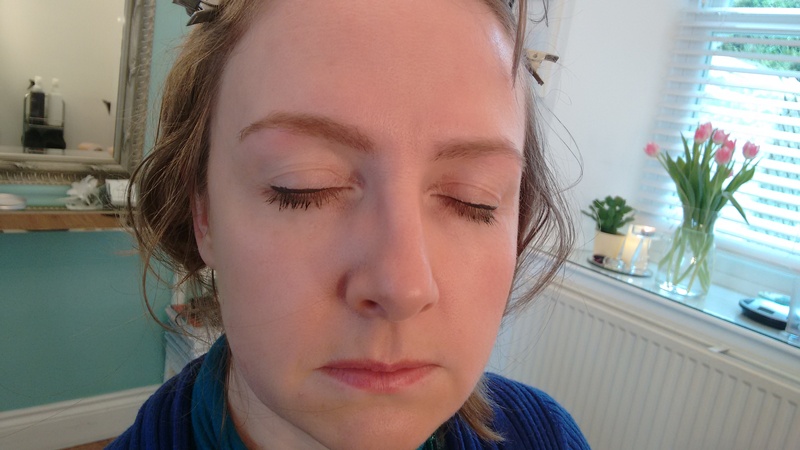 My eyebrows are apparently fundamentally good, and Maria plucked a good number of hairs from them to give a better shape, then showed me how to colour them, to give more of a framing effect. You might already know how to do this, of course, but it was all news to me! Did you know that glasses on short-sighted people cause their eyes to look smaller than they actually are? I hadn’t put any thought into it, but it’s definitely logical, and needs to be considered when applying eye makeup. 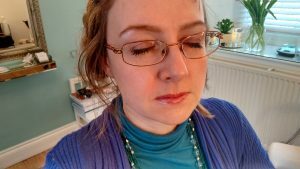 The shape of my eyes is slightly altered by the glasses, and the way they sit across my face, and Maria showed me how to use eyeliner of different colours, eyeshadow and mascara, to balance the effect of the glasses, open my eyes up, and make them the focal point of my face. From comments afterwards, they were definitely more obvious, and my natural blue colour stood out more. In a break between playing with makeup and colours, Maria played with my hair as well. I’m accustomed to dealing with my daughter’s long hair, and my own, when it was longer in my teens and twenties, but now I tend to wash it, let it dry naturally, and have it the same every day. I’ll be back for another hair appointment later (and another blog), but Maria showed me how to scoop my shoulder-length, wavy hair into a series of glamourous evening looks, with clips I already own. I may need to go shopping for more, as it did look rather good! My fringe has always been a little bit independent, and I was astonished how good Maria made it look, with just a little brush-and-dryer magic. I can do that myself – now I know how. Interspersed into the discussion were recommendations for just a few more products to buy, tips for getting eyeliner to look just right, and ‘wow, I’d never have thought of that’ ideas for disguising or enhancing different features. Maria gave me the knowledge to make the most of my face, to appear professional without being over-done, or choosing a look that is wrong for my age. I left looking fabulous, feeling more confident, and happy that I could manage to replicate what Maria had shown me. I am delighted to recommend Maria’s Professional Styling Consultation to any woman in business who needs to project a smart image. You’ll feel better, because you’ll know you look better, and other people will respond to that. It’s a business investment you won’t regret, as well as being a wonderful opportunity to have a professional London makeup artist give you her undivided attention!